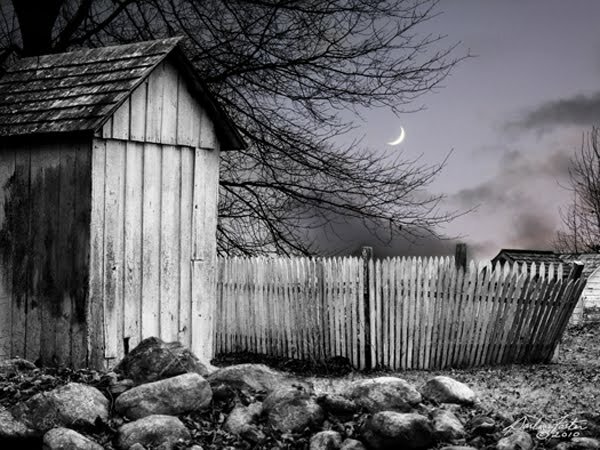 "The Twelfth Moon" started with a photo taken at Mill Creek Village, New Jersey several years ago. I always loved the textures involved with the wood of the old shed, the falling down fence and the rocks in the foreground but I never found the right composition until now. I was arriving home a few nights ago just after sunset, looked up and saw a perfect crescent moon with a beautiful lavender sky behind it. Of course, I ran for my camera and was able to get an image that created just the mood I wanted for the background. The title is a Native American name for the December moon which marks the onset of winter.